Today, APA released the second part of their annual Stress in America™ report, which focuses on something that’s super real for me and, according to the report, 86% of US adults: social media stress. Apparently, I’m not the only one who is a “constant checker”–someone who constantly or frequently checks their email, texts and social media accounts…and it’s driving us insane. Yikes. The stress of being constantly connected is something I personally have been grappling with for years and am kind of obsessed with in terms of how it’s changing not only me but just humans–something I’ve written about before and continue to read about. Then there’s the next-level stress that comes with the compound effects of being constantly connected just in general but then also having a job that basically requires it–social media and community management. If, according to this report, the average “constant checker” reports an average stress level of 5.3 out of 10, those of us whose jobs (well, and/or hobbies–e.g. blogging) have us uber connected, are probably even more stressed. 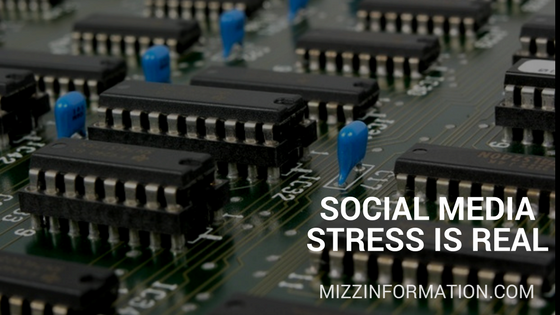 Or not even just social media types, actually–the highest stress levels reported in the survey findings are actually from people who check work email constantly even on days off–they’re reporting a level of 6.0. The findings show, though, that social media negatively effects a greater proportion of of constant checkers compared to those who don’t check their devices as frequently. And, if just regular social media stress weren’t already high enough, the report also highlights that the recent political climate is ratcheting social media stress even higher: 42% of constant checkers say that political and cultural discussions on social media cause them stress, compared to 33% of non-constant checkers. So what can I–and we, collectively–do to combat this pervading stress that’s eroding our mental and physical health? The report cites APA coworker and psychologist, Lynn Bufka, PhD: “taking a digital detox is one of the most helpful ways to manage stress related to technology use.” But while I and the rest of us already know this and strive for it, it’s not that easy. APA does offer guidance, as do Beth Kanter and Aliza Sherman in their book, The Happy, Healthy Nonprofit…but then there’s actually doing it. What might work for people whose jobs don’t require them to be connected virtually around the clock, for many social media and community managers–and, of course, journalists–digital detox is something they can only dream about if they want to keep earning a paycheck. Anyway, speaking of detox…I’ll digress. But if any of you have tips or other resources around de-stressing and digital detoxing, please feel free to share in the comments. Meanwhile, Europe’s greatest energy savings potential lies in buildings.